A debut double from striker Ashley Grimes wasn’t enough for Edinburgh City to claim the win, but Gary Jardine’s men prevailed 4-2 in a penalty shoot-out to claim a bonus point after a 2-2 draw with Berwick Rangers their opening Betfred Cup Group F fixture. Grimes’ deflected opener was cancelled out by Aaron Murrell’s equaliser, only for Grimes to fire one in to the top corner almost immediately to restore City’s one-goal advantage. Berwick weren’t to be denied however, as Pat Scullion netted a second leveller with just seven minutes remaining. City gave competitive debuts to four of their new summer singings. Grimes, David Verlaque and Sean Mackie started along side Calum Hall. Having been released by Hibs and training with Motherwell, City boss Gary Jardine signed the 16-year-old to the first team squad after impressing during pre-season. Bulgarian Zdravko Karadachki made his first appearance as a second half-substitute, along with Moses Olanrewaju. The visitors started the brighter, with Lavery hitting the target twice in quick succession, but neither effort properly tested Calum Antell. Grimes registered City’s only attempt of the opening ten minutes, but his low drive was tame and easily dealt with by on-loan Rangers keeper Robby McCrorie. The striker did manage to mark the occasion with his first goal since moving north. Fed by Josh Walker, the Mancunian’s shot from the edge of the area took a deflection on it’s way to goal, wrong-footing McCrorie to give City the lead. John Coughlin’s team were still proving a threat, Murrell next to be denied when he fired straight at Antell. 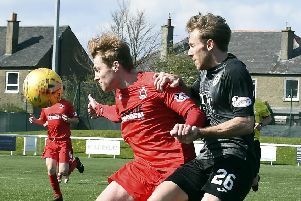 The former Dundee United youngster made no mistake shortly after, however, racing on to a great through ball as calmly dispatching past Antell. The lead barely lasted a minute though, with Grimes this time not requiring the aid of a deflection, brilliantly finding the top corner from the angle of the box. Murrell had the ball in the net in very similar circumstances again, but was denied by an offside flag on the far side. The Wee Rangers went close to restoring parity once more shortly after the break, but Michael McKenna’s wicked free-kick bounced just wide of the post. Murrell and Antell were having something of a personal duel and the Welsh keeper had to throw himself to his left to keep out the number 21’s strike from the edge of the box. Grimes came extremely close to a hat-trick when he got a toe to the ball ahead of McCrorie, but the keeper did well to recover and palm the ball off the City striker as he was preparing to roll it in from a tight angle. He was even closer soon after, meeting strike partner Lewis Allan’s cross with a powerful header that crashed off the cross bar with McCrorie rooted to the spot. Berwick sub Gary Phillips spurned a great opportunity to level with ten to go. He was left all alone at the back post, but blazed his first-time effort over when he had plenty of time to take a touch before shooting. Another equaliser did come just three minutes later, when a bouncing ball fell to Scullion, who drilled low past Antell in to the far corner through a sea of bodies. It was end-to-end stuff by this point and Grimes was denied a treble yet again when his first-time shot was blocked from close range following good work from Allan down the right. Antell then had to be at full-stretch to tip Greg Rutherford’s looping header over the bar, before McCrorie clumsily parried a dipping Karadachki shot wide to ensure penalties were required. City were flawless from the spot, with Berwick’s Chris McDonald hitting the post and Antell saving from Scullion to ensure a 4-2 shoot-out success. Edinburgh City: Antell, McKee, Walker, Laird, Beattie (Harrison 62), Grimes, Hall (Olanrewaju 75), Dunn (Karadachki 69), Verlaque, Mackie, Allan. Berwick Rangers: McCrorie, Fleming, Notman ( Donaldson 72), Thomson ( Phillips61), Lavery (Rutherford 57), McKenna, Irving, Stewart, McDonald, Murrell, Scullion.